Kimber Lee currently resides in Austin where she is a graduate student in the University of Texas at Austin MFA Playwriting Program. Before returning to school, Kimber worked as a professional actor, theatre administrator, and director. Acting credits include work with A Contemporary Theatre, Seattle Repertory Theatre, California Shakespeare Festival, Intiman Theatre, Seattle Children’s Theatre, and Indiana Repertory Theatre; and her writing has been published nationally in KoreAm Journal and Audrey Magazine. Her plays have been produced in Seattle, NYC, Aspen, and San Diego. She also served as Associate Director for Mo`olelo Performing Arts Company in San Diego, and recently returned from a summer working as the Literary Resident at Playwrights Horizons in NYC. 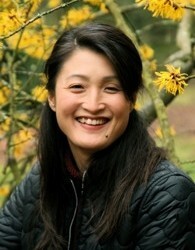 Her play TOPPER was selected as a winner of the 2009 Theatre Masters National MFA Playwriting Competition. Her full-length play FIGHT has been awarded the Holland New Voices Award as part of selection to the Great Plains Theatre Conference in May 2010, and is also currently a finalist for the 2010 O’Neill National Playwrights Conference. Where did you get the idea for Topper? Desperation. I wrote it during a 14/48 weekend, and the theme was “kissing” (shakes fist at Matt Richter – oh yes, I remember who did that). The image of a wedding cake topper with a kissing bride and groom kept swimming into my sleep-deprived brain, so I abandoned the other idea I had and started writing TOPPER at about 5:00am out of sheer terror that I wouldn’t have anything. What is your favorite moment in the play? At the very end, when Greg and Carl are startled into reaching for each other out of instinct. Who is your current playwright talent crush? I get lots of those, and at the same time: Melissa James Gibson, Jen Haley, Allison Moore, Madeleine George, Gregory Moss, and my classmate in the UT Austin Playwriting Program, Meghan Kennedy. The secret to writing is to….WRITE. Never give up. And have a hobby that connects you to your physical self, because this work can be very head-buried-in-laptop, and some great writing can come through a physical connection. What kind of theater do you love? Sharp, language-rich, funny, smart, inventive, take-no-prisoners theatre that is willing to risk its own importance in order to show us something true, something with heart – whatever form that may take. The only other thing I do besides grad school is boxing. I train at a boxing gym 6 days a week, and teach classes there now, too. Do you have a favorite and least favorite word?